Talia graduated with a Masters in Osteopathy from the British College of Osteopathic Medicine. She also has a diploma in naturopathy and is trained in kinesio taping and western acupuncture. 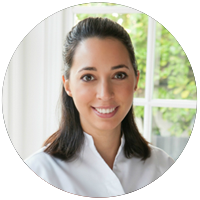 Talia is registered with the General Osteopathic Council and is a member of the Institute of Osteopathy. Talia has a special interest in paediatric and obstetric osteopathy and is happy using both a structural and cranial approach depending on the patients’ requirements.